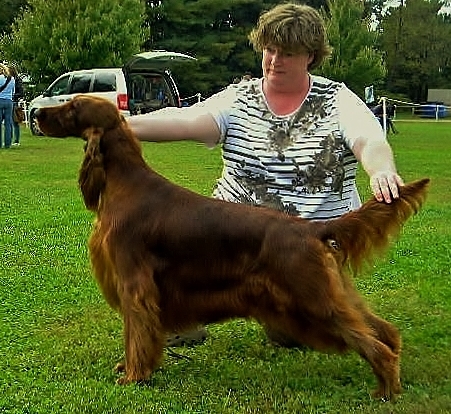 Erinshire Irish Setters breeds puppies usually once, or twice a year. Our last litter the “Magic Litter” born on January 10, 2018, with 5 live puppies. All the puppies are now placed with their new families by April. 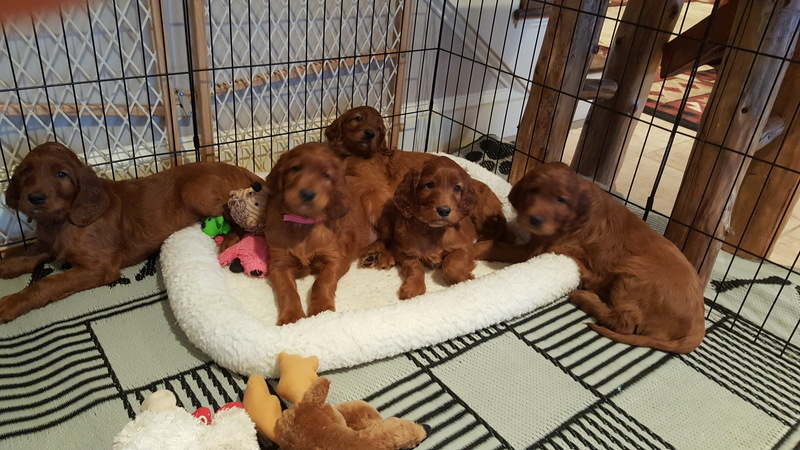 We were very pleased with the inquiries we had for these puppies and the wonderful homes we selected, and we thank you for waiting for your puppy. Some of theses families had waited more than 8 months for this litter. Our next breeding will most likely be later in the fall of 2018 or in early 2019. In the meantime we are raising Shannon to begin her show championship and when she is ready, she will produce the next generation of Erinshire Irish Setters. Outside at 7 weeks…..in the snow! 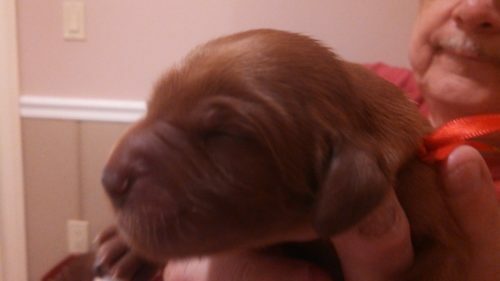 One of my favorites…… a boy of course…..
Planning Litter in the fall of 2017 …. 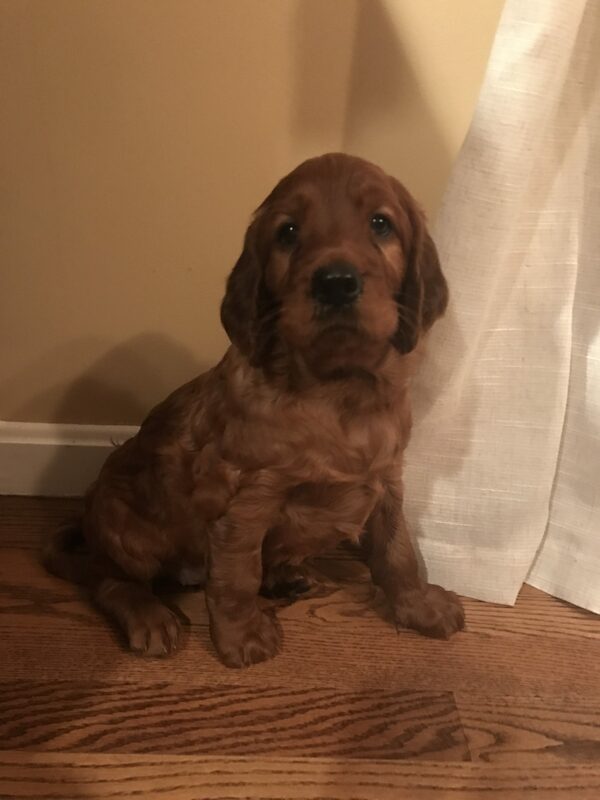 Catie and Eliott were bred in early November , this a repeat breeding that produced a singleton puppy early last summer, our Shannon (see pix below) and we have a litter due January 10, 2018. 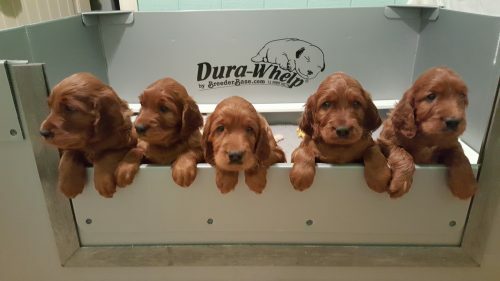 Please proceed to our web page on “Purchasing and Erinshire puppy” we do have an active waiting list, and we will be contacting those who are on that list as soon as puppies are born. Born June 16, 2017 weight 17 oz. Eliott is the dog from our home bred litter who won Best In Show in 2015 and numerous other wins. Catie is a daughter out of “Robert” BIS, BISS, Am. & Can. GGCH Captiva’s Turning Heads X “Scarlett” Am. Ch. Erinshire’s Forever Stars Will Shine. Update: the breeding of Catie and Eliott was earlier than we expected. Catie came into season on April 1st, not late May as we expected. 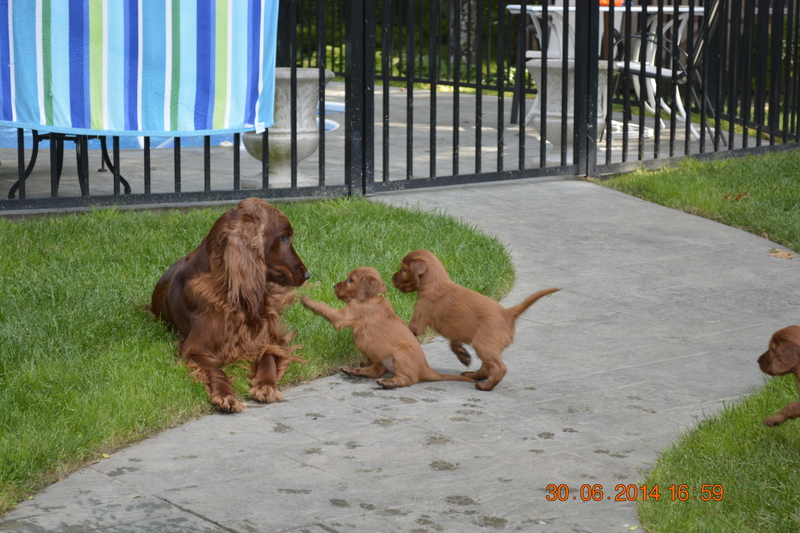 We bred her in April and on June 16th, we have one puppy from that breeding …. 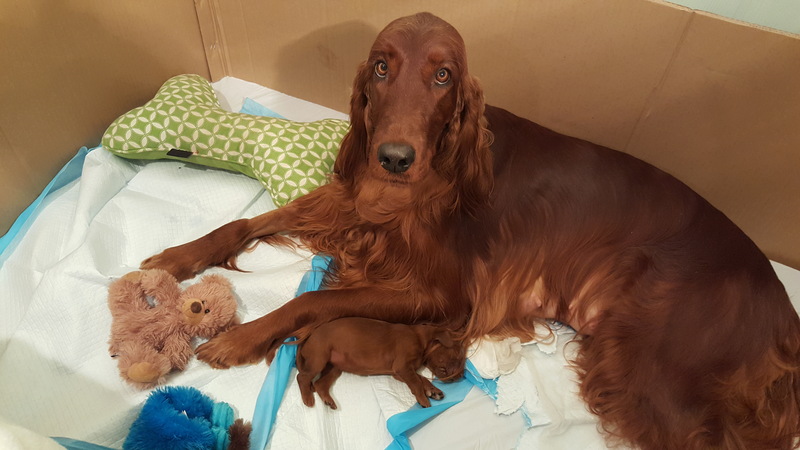 on June 6th x-ray showed there was just a single puppy present…..and growing very large….. she was born on Friday June 16th and weighted 17oz……too large to whelp so the c-section was planned. All is going well, Catie has taken to motherhood well…….So far we think we are going to Reg. 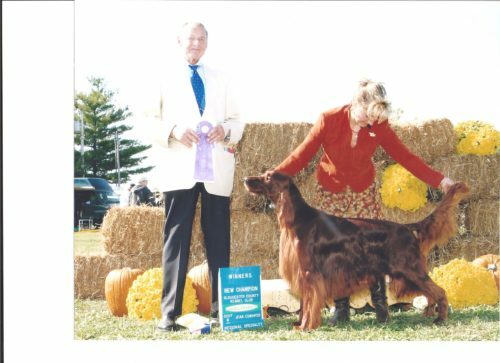 her with the AKC as Erinshire’s The One and The Only………as for a call name ….we have not decided or should I say we have not agreed yet…. we are going to keep her for ourselves…………..We are Sorry! ……..but she is something we have waited for along time…. 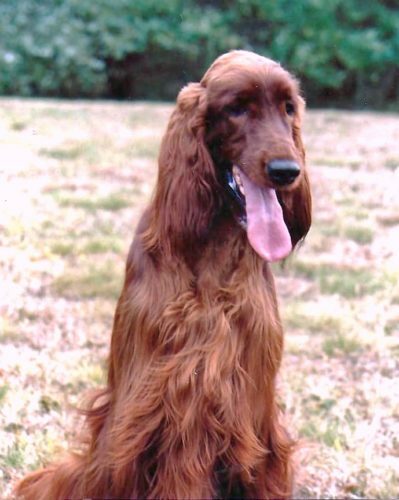 Eliott daughter…..a Robert grand-daughter……….she could be the best of both pedigrees….. we will be breeding her someday…..We will definitely repeat this breeding in a year. 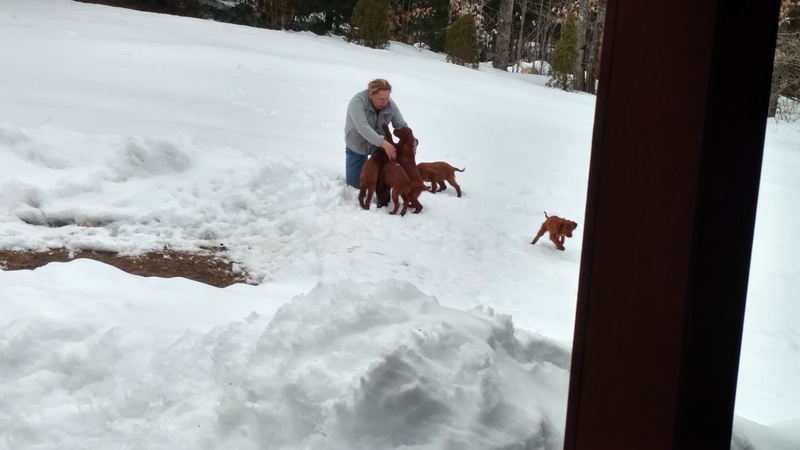 ……….Thanks for your interest and staying with us…………..So please remember I am a breeder that only wants to produce the best quality and healthy puppies for you and your family. Breeding puppies is never an exact science, or timed as we would like, so we will continue along this journey as long as it is a fit for our breeding program. Thank you for your continued interest in our Irish Setters….. 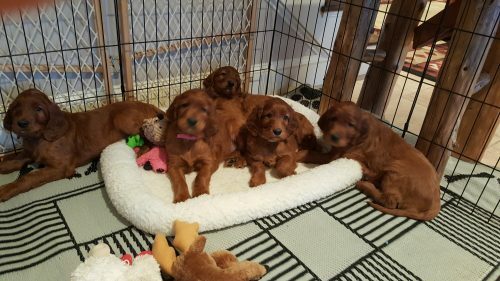 Please read below pictures for details about our philosophy of raising puppies and what you can expect from us, when considering one of our puppies for your family. The “Puppy Application” is only available by email to us at Bpierhal@aol.com on the tab “Purchasing a Puppy “on this web site….proceed there if you feel we are the breeder for you. Please keep in touch with us for updates on litters. 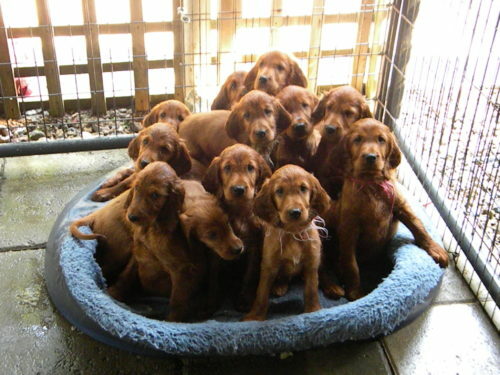 We are a small kennel and produce puppies usually because we want a new puppy for ourselves. 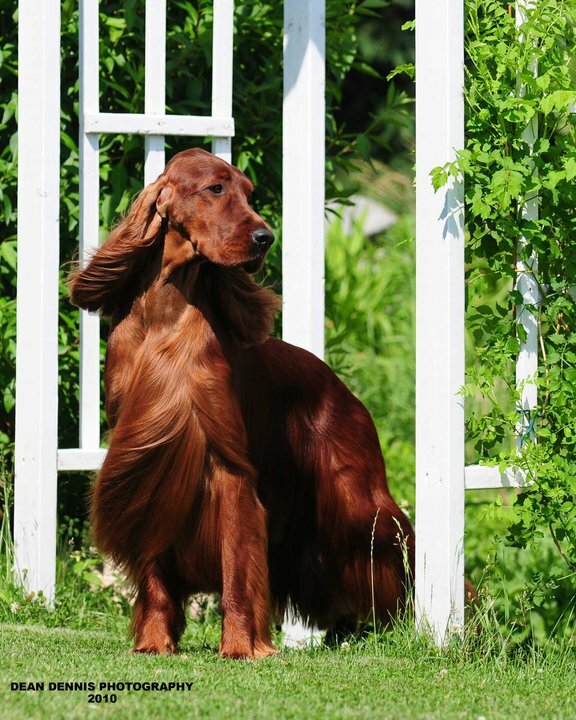 Now that we have a wonderful kennel facility, that provides all the necessary tools and space to raise Irish Setters, we look forward to breeding a litter of puppies once or twice a year. This of course depends when and how often we can provide the quality of care and time it takes to raise a litter. From breeding the female to puppies whelped is usually 9 weeks (63-65 days) and then we keep the puppies with us until they are at least 9-10 weeks, that’s about 4 1/2 months of care of the mother and her litter, 24 hrs. 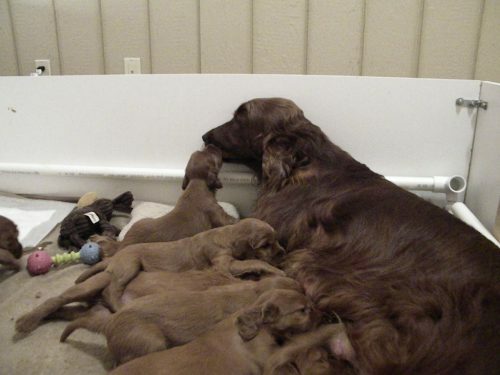 7 days a week, as the litter gets older, the mother does less and the humans do more. 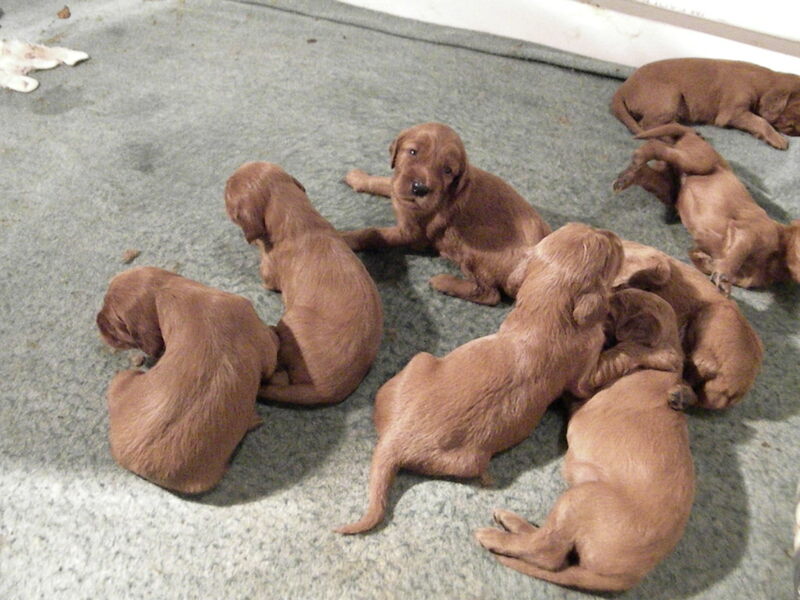 The “Forever” litter had 12 puppies, that was a very busy time. It is a serious commitment to take care of newborn puppies and sometimes heart-breaking, if we lose even a still born. 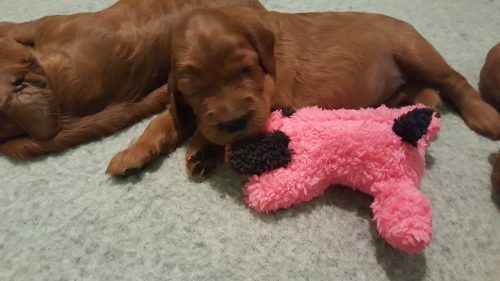 But, the rewards do come through when you place a puppy in their new home and you see the joy it gives the new family, it is worth all the work. All our the puppies are seen by a vet starting at about 6 weeks, and follow-up visits as vaccinations begin and eventually each puppy is microchipped and has a health certificate from our vet before leaving our kennel. 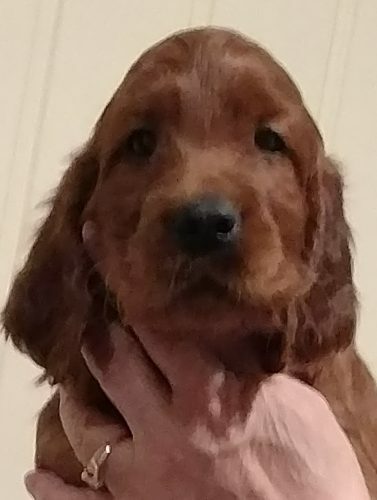 Erinshire Irish Setter pays for the microchips and the American Kennel Club registration for all our puppies, once their forever homes are decided, paperwork is provided when the puppy is delivered to the owners. Once again we kept a male and a female, Connor and Catie. All the other puppies are placed. Connor and Catie, stayed. They have their own page for details on their show plans and future litters. 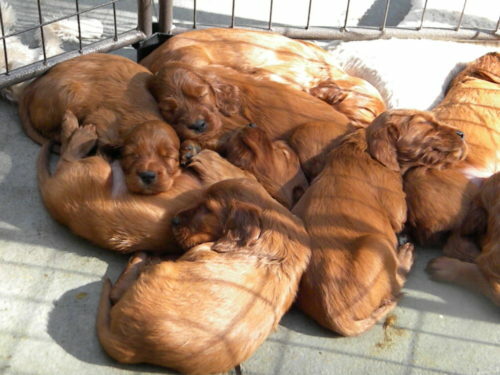 In 2010 on Easter Sunday, April 04th, a litter was born from the breeding of CH. Piperbrook’s Forever A Star ” Reagan” and Orchard Farm Lace to Erinshire “Erin”. 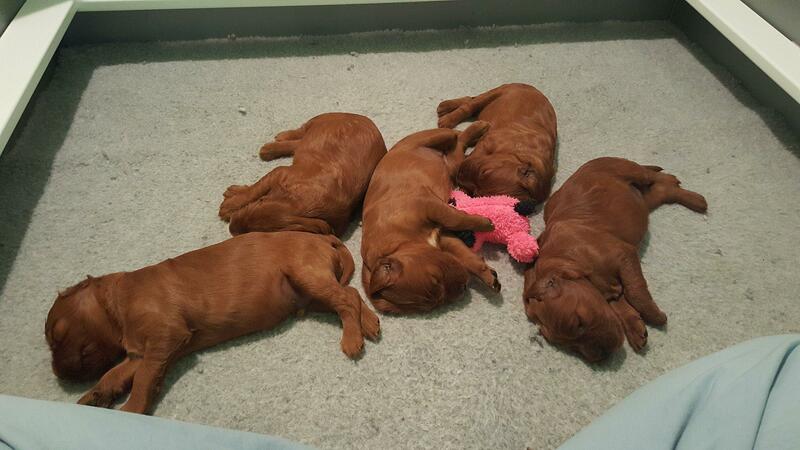 There were 6 males and 6 females in the “Forever Litter” and we kept Eliott and Scarlett from that litter. 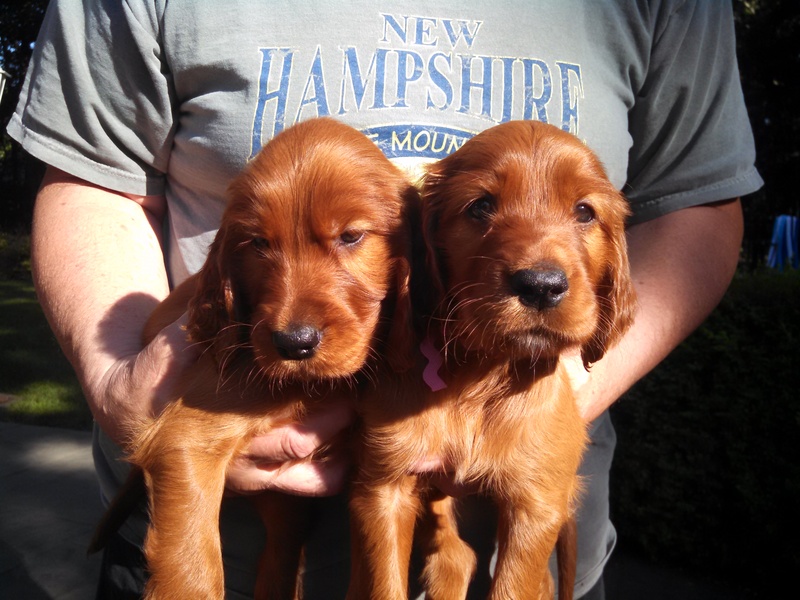 Pictures of Reagan on the left and Erin on the right, litter pictures below.